Posted on July 14, 2014, in Book Reviews, New Zealand authors, world literature. Bookmark the permalink. 26 Comments. Eleanor Catton claims never to write about anything she hasn’t experienced. This must mean that she was in the 1860s gold rush..,how OLD is she ? I didn’t finish it and only know one person who has ! Anyone who makes any unfavourable criticism is a cultureless fool as far as EC is concerned; she really is a precious wee princess. Her fury when she didn’t win the Book of the Year in New Zealand (she won the People’s Choice and the Fiction awards) was terrible and she’s been banging on about it ever since, as if she was robbed of something that was hers as of right. She didn’t win because of jealousy over the Booker Award, according to her. Agreed, and well put. It was an enjoyable read but lacked emotion or character. And the whole astrology thing was pointless – would have been better if it had integral to the plot but the one time it was a plot point it was a pretty minor one. I also didn’t find the denouement particularly clever or surprising. I was very surprised the Booker judges picked it. Perhaps they just appreciated its readability? First of all, hello. Nice to meet you via LitLove’s blog. You have done a masterful job in writing your review here; I so struggled with mine last winter I wonder if it makes sense at all. While thoroughly enjoying the book, and it’s intricacy, I mourned a lack of philosophical depth as well. I love a good story, but I want meaning behind it. As for judges being baffling, I was never more disappointed when the IFFP awarded The Iraqi Christ the prize in May. While an interesting book, I felt the move was more political than merited. Edward St. Aubyn has written a nice parody on the Booker in his latest book, Lost for Words. I look forward to more conversations with you. Your blog, your writing, are wonderful. Oh gosh I am blushing now Bellezza. I find writing these reviews quite tough which is why I am so far behind with them. Some I am happy with then others just don’t seem to come together. The St Aubyn book had some mixed reviews didn’t it. I agree that the structure dominated the book and it felt like a distraction at times. It is still a work to be admired though. I do admire and appreciate it, up to a point. I wonder whether less structure might actually have helped the book even more. Agree, she was by far the most engaging character and the one I wanted to know so much more about. 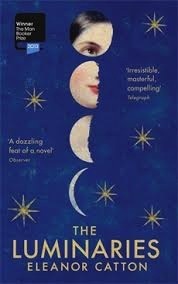 I did love the book, but I agree the astrological stuff seemed pointless and added nothing for me especially as I have no interest in astrology. For me the brilliance was in the weaving together of the story strands and the atmosphere she created of the town. I can only repeat some of what’s above. I’ve had this sitting to be read for ages but I can never quite find the time/inclination/mood or whatever else I need to make me pick it up. But I think deep down it’s just that I can’t see how it can be as good as Harvest! I still have this to read. There never seems to be a long enough gap between books that need reading for a specific date to get round to it. However, like you, I doubt that any book could be better than Harvest. I wonder what the Booker judges have in store for us this year now that American titles are to be considered? Only nine days to go to the long list announcement. I’ve been trying to think what we might see in the long list this year but haven’t really come up with anything yet. Nothing stands out so far for me from this year’s titles. I liked this considerably more than you, I think. I agree about the pointlessness of the astrological stuff, but I felt that she gradually built up such a detailed picture of the town that i actually felt I had been there. It was the town as a whole that I loved rather than the individual characters – and when I subsequently googled pictures of the town I realised what an accurate picture she had planted in my mind. I recently read The Truth About the Harry Quebert Affair, a book that has received more than its share of press over here. That would normally be enough to put me off, but I had a review copy and the premise sounded tempting. 700 pages later… what a disappointment. I was tempted by this one, but passed as I usually don’t go beyond WWI except for classics. It’s probably a good thing I didn’t hear about the Wilkie Collins comparison as that may have led me to the book. What did you think about the length of the book? I haven’t read it, but I’ve considered picking it up. For a mystery, the book seems absurdly long. Do you think the length was necessary? Is it more than just a mystery? Thanks. It doesn’t feel particularly long Fariba, partly because the narrative keeps switching between the different individuals. yes it is a bit more than just a mystery – at the heart of it is a love affair really. I read this book early this year and was quite taken by it. I loved the way it curled in on itself and left us with just two characters wrapped in it’s web. I loved it as a mirror/commentary on the history of the novel — the waxing and waning of narration and dialogue — and the way the chapters changed in composition. I did not understand the astrological significance beyond some general heavenly/earthly influences or constellations of characters. (I fear if anyone looked at this closely, it would not stand up structurally and if it does, it is not worth the trouble of investigating unless you are an avid astrologer — and many readers are not. I have terrible trouble rating books as winners or not and haven’t read Harvest. I agree that I don’t know how this book will stand up in time — if that should be some measure of consideration, but I found it both innovative and intriguing. I may not have read it, if it didn’t get Booker attention. I think you read it much more attentively than I did Barbara. I did like the way the book went back to the beginning in order to draw it to a conclusion – far more satisfying that way. Nice to hear from you again by the way.